Please contact us if you would like any further information about one of these quality new home communities. We are here to help. 10 luxury contemporary townhomes in the heart of the Uptown district. Homes are 3 & 4 level design ranging from 2,015 to 2,246 sq. ft. with 2 & 3 bedrooms, up to 3 baths, 2 & 3-car direct-access garages. These homes have private elevators in most plans. Occupancy is anticipated to be November or December, 2017. 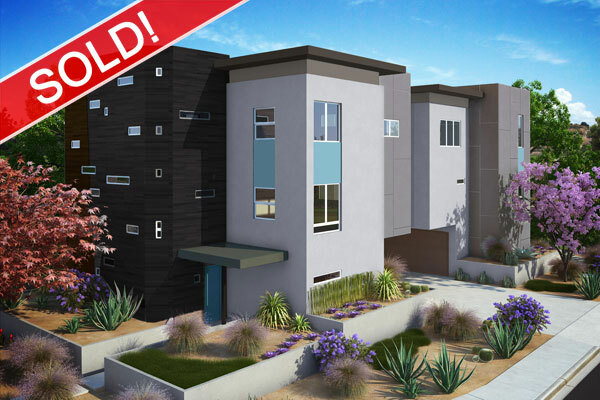 Five luxury townhomes in the heart of the very trendy Hillcrest neighborhood. Homes will have 2 & 3 bedrooms, 1,853 to 2,286 sq. ft. and a 2-car, direct-access garage. Only 3 deluxe homes just 4 blocks from Balboa Park with downtown San Diego city and Bay views. Home will offer 2 & 3 bedrooms with 2.051 to 2,314 sq. ft. with a 2-car direct-access garage. 12 single-family detached homes 2.5 blocks from the beach. Some homes have ocean or mountain views. Single and two-story homes are available ranging from 1,628 to 4.321 sq. ft. with 3 to 5 bedrooms & 2-3 car garage. 4 luxury townhomes just 2 blocks from the harbor with amazing city and harbor views. Homes are a tri-level design ranging from 1,348 to 1,713 sq. ft. with 2 bedrooms, 2.5 baths and a 2-car direct-access garage.